What does St George Foundation have to offer? We are the leading child welfare organisation in our area ‘Western Rural’ (Just outside Freetown with a population of approx 250,000). We have passionate and courageous staff, experienced with child welfare, counselling, family tracing, training care givers and caring for children on a daily basis. 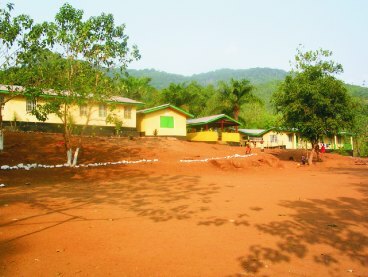 We have 11 years experience of working in Sierra Leone. We have one of the very few residential care homes for children that can handle a large influx. We already work directly with the Sierra Leone government and UNICEF. Monitor and report all cases of Ebola within the ‘Western Rural’ area to the government and UNICEF. Educate the population of Western Rural (250,000 people) on how not to spread Ebola. This is a slow and lengthy task. Record and report in Western Rural all child welfare issues relating to Ebola. 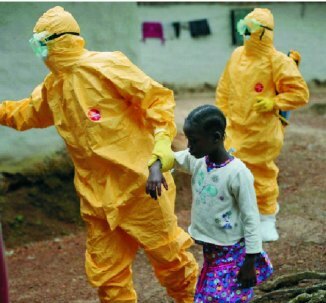 Deal with all child welfare issues relating to Ebola. Have now helped 175 children (4 Feb 2015) since the outbreak began. Trace and reunify children with their families if separated. Distribute emergency packs (provided by UNICEF). These contain replacement clothing, bedding and food. BBC Breakfast interviewed Tulip Mazumdar, BBC Global health reporter, to talk about the St George Foundation. Another report from our children's home was broadcast on BBC News at One following Augustin Baker's death. BBC Radio 4's Today program reported Augustin Baker's death and gave a short tribute to his work. BBC News reported on the sad news of the death of one of our staff, Augustin Baker, and the great work he had been carrying out for Ebola orphans. He will be greatly missed by all at St George. BBC News article on the self-imposed quarantine at our children's home following the Ebola infection of Augustin Baker, one of our staff. BBC News at Six broadcast this video. See also the associated BBC News article. Another BBC News article featured the St George Foundation. Our children’s home is now acting as an emergency Interim Care Centre (ICC) for child victims of Ebola. We provide residential care for 3-6 weeks for them to recuperate physically, receive counselling and we trace and educate relatives about Ebola victims. If no relatives can be traced we are training foster families. Each child costs us £200 and we have received no funding for this work to date (1 Dec 2014) from any government or national organisation or national campaign. This little girl was taken from her home when she was seen to have the initial symptoms of Ebola. 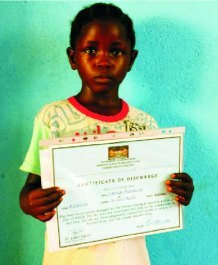 Once taken in by UNICEF she recovered from Ebola and was given her Certificate of discharge. UNICEF then sent this little girl onto St George Foundation at our Care Centre in Freetown. She is now living here with us, for recuperation and counselling while staff trace and train relatives or foster parents to get them back into the community. A few members of the amazing team working here with us. Alhaji became mentally distressed after been infected and also losing both parents to Ebola. After the death of his parents their house was quarantined for more than 21 days and during this quarantined period, 9 of his other relatives were found to be positive and died. During a rapid registration process conducted at this quarantined house by St. George Foundation in collaboration with the Ministry of Social Welfare Gender and Children’s Affairs they identified children with signs and symptoms of Ebola and who have also lost one or both parents to Ebola. Alhaji was identify and taken to hasting treatment centre where he survived Ebola and was later brought to SGF interim care centre for psychosocial support, family tracing and reunification. According to Alimamy they were living in ‘one big happy family’ until the Ebola outbreak set them apart, it killed all the ones who were supposed to look after the young ones. He was attending the Wellington Muslim Association Primary School. After the death of his father, their house was quarantined for more than 21 days and during this period, he lost 22 of his relatives including his mother. After they had been released from quarantine, a rapid registration was conducted by St George Foundation and Ministry of Social Welfare Gender and Children’s Affairs at their house to identify child protection concerns. After been registered he was brought to St George Foundation interim care centre for a transitory care, psychosocial support and family tracing and reunification. Fatima, her mother and step father were taken to Jui Ebola holding centre after the death of Fatima’s grandmother for laboratory test and treatment. Unfortunately, Fatima’s mother and step father died in the holding centre. A few days later Fatima’s lab result came and she was negative, so the hospital management informed Unicef and they referred her to St George Foundation. Mohamed attends the Filomat Primary School Waterloo. He lost his parents due to Ebola. Mohamed’s father contracted the disease through his neighbour Pa Bai when he was sick. Mohamed’s father visited him regularly and just after the death of Pa Bai Mohamed’s father died too. Due to this, their house was quarantined for more than 21 days during the quarantine period. Seven of his family member showed signs and symptoms of Ebola and they were taken to the hospital for lab test and treatment but unfortunately all seven of them died including his mother. After their quarantine period was over, The Ministry of Social Welfare Gender and Children Affairs and St George Foundation conducted rapid registration to identify child protection concerns. A few days after the registration, Mohamed was taken to St George Foundation interim care centre for care and supervision and family tracing and reunification.